After going against his father’s wishes and abandoning a promising career in law in favor of writing, Voltaire fell consistently afoul of French authorities and was no stranger to controversy. Besides being exiled from Paris for a time in his early career, he was also imprisoned in the infamous Bastille prison in Paris for 11 months, using his time there to write. A major turning point in his life, which had it not happened may have resulted in history forgetting the brilliant man, was shortly after he returned from exile in England and had a fortuitous encounter with an equally brilliant mathematician, Charles Marie de la Condamine, at a dinner party held by Charles du Fay in 1728. Voltaire at the time was struggling financially, but de la Condamine had a plan which he proposed to Voltaire that would help make Voltaire and himself a boatload of money via ever so slightly unscrupulous means, though technically not breaking any laws. During the early part of the eighteenth century, the French government issued a series of bonds to help raise money. With the decline of the French economy in the 1720s, they were forced to cut the interest rates on the bonds, which drastically diminished the market value of said bonds. This resulted in the French government having considerable difficulty in raising money via new bond sales. One Michel Robert Le Pelletier-Desforts, Deputy Finance Minister for France, had a “brilliant” idea as to how to raise the value of existing bonds, encourage the sale of new bonds, and earn some money for the government- a trifecta. His idea was to allow bond owners to buy a lottery ticket linked to the value of their bonds (each ticket costing 1/1000th of the bond’s value). The winner would get the face value of their bond, which was more than what they could get on the market at this point, plus a ‘jackpot’ of 500,000 livres, which would make the winner instantly wealthy. While there’s no great way to say how much 500,000 livres is in modern day dollars, just for some very broad references, this would be about $6.2 million today by buying power or about $6.4 million worth of gold at the time. Another way to attempt a loose translation of dollar value is to look at how many hours of labor 500,000 livres could buy in France at the time using average income, then translate this to how much it would cost to buy that same labor in modern times. If going by that valuation, 500,000 livres is approximately $121 million today. At whatever end of the spectrum there, the person winning the prize would walk away set for life. Unfortunately for the government, and fortunate for those of you who enjoy Voltaire’s work, the mathematics behind this new government fundraising scheme was fundamentally flawed. You see, if you owned a bond worth a relatively small amount, with the lotto ticket for the bond costing just 1/1000th of the value, you could buy the lotto tickets cheaply, yet your lotto ticket had just as much of a chance of winning as someone who owned a bond for, say, 100,000 livres and had to buy their ticket for 100 livres. Thus, when La Condamine crunched the numbers, he realized that if he was able to buy up a certain percentage of the existing small bonds, he could then acquire the necessary entrees in the lotto to reasonably ensure he’d win, all while spending significantly less than the jackpot and also making a profit on the bonds themselves when he ultimately won and the government had to pay face value for them. To implement the scheme, the pair needed investors to ensure they could buy up enough bonds to reasonably insure they’d win. This is where Voltaire comes in. 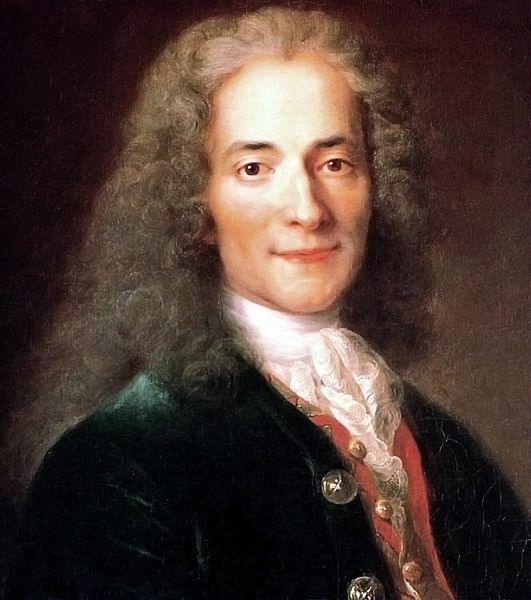 Voltaire was not rich nor particularly famous at this point, but he was extremely charismatic, well connected, and had developed a healthy distrust and dislike for the French government. Ultimately the pair were able to create a syndicate with various wealthy patrons with sufficient capital to buy up the necessary bonds and lottery tickets. The problem was that there were only a handful of notaries one could go to get the lottery tickets. If one person was seen to be the recipient of most of the lottery tickets each time, the scheme would quickly fail as the government would realize what was happening. Voltaire again proved his worth by working out a deal with one of the notaries empowered to issue lotto tickets. The syndicate collected their winnings over and over again from the government office, making themselves copious amounts of money and paying shares of the winnings out appropriately to those involved. This went on for about two years before the plan was let down partially by Voltaire being Voltaire. Generally most people would write things on the back of their lotto tickets, usually good luck phrases. Voltaire, in his typical fashion, would instead write phrases mocking the government and officials, as well as simply partially giving away their scheme and who was involved, like “Here’s to the good idea of Marie de la Condamine”. He’d then sign the tickets with various made up names. The organizers of the lottery eventually realized from this that many of the prizes were being won by the same group and they had not trouble figuring out who was behind it. The French finance minister took the syndicate and Voltaire to court, but as the group had done nothing illegal, they were allowed to keep the prize money. However, the lottery was cancelled after the court case against Voltaire’s syndicate collapsed. In total, in the less than two years they ran the scheme, it’s rumored that Voltaire’s share amounted to about 500,000 livres of the total prize money, with the rest being distributed among the syndicate. Both Voltaire and de la Condamine were now ridiculously wealthy, and were able to pursue their scientific and literary endeavors at their leisure. As for the somewhat eccentric La Condamine, who had a reputation for insatiable curiosity about all things science related, he continued his work in mathematics, and led a trip to the Andes where he attempted to measure the circumference of the Earth, as well as to determine whether or not the Earth was a perfect sphere or not (as they discovered, not). One of the other reasons he was curious about this was to further settle the argument of whether the Earth was flattened at the poles or the equator, with the Newtonian view that it flattened at the poles ultimately ending up being correct. While in South America, La Condamine also mapped the Amazon River, the first scientific exploration of the region. In addition, he helped define the length of a meter and published the first known scientific paper on rubber, which he helped introduce to Europe. His work studying quinine also ultimately led to a more effective way to treat malaria and he helped champion inoculating people against smallpox, among many other major accomplishments. Eventually a 55 year old La Condamine married his 25 year old niece, Charlotte Bouzier d’Estouilly in 1756, seemingly in part because her widowed mother (his sister), Louise Hélène de La Condamine, wasn’t sufficiently wealthy to ensure Charlotte would be able to find a well to do husband. It was also reported that during the surgery, the ever inquisitive La Condamine continually interrupted the procedure to ask questions of the doctor. In the end, he survived the procedure and it seemingly was a success at fixing the hernia, but he died a couple days later, presumably from infection. As for Voltaire, he used his lottery winnings to invest in various business opportunities, often using information he learned from well placed individuals, like when to buy and sell certain shares of various ventures. While today this would be called insider trading, there was no law against it in eighteenth century France, and Voltaire soon went from reasonably wealthy to “Mr. Burns” wealthy. This didn’t stop him in his quest to alienate everybody powerful he came into contact with – from Parisian society to Frederick the Great of Prussia, to the government of Geneva; in this, his wealth came in handy as he was constantly in need of escaping the wrath of the authorities in one city or another, and even found himself exiled from Paris again. Without such great wealth, he may well have ultimately found his head separated from his body or been thrown in prison indefinitely. Instead, Voltaire became regarded as one of the greatest thinkers and writers of his age, as well as an extreme Smart Alec and one of the key figures of the Enlightenment. Seemingly following in La Condamine’s footsteps, Voltaire, who had numerous mistresses and love-interests throughout his lifetime, eventually fell in love with his widowed niece, Marie Louise Mignot (daughter of his sister). Voltaire actually originally saw to it that Marie was given an adequate dowry after the death of her father so she could marry army officer Nicolas-Charles Denis, but her husband died a few years later. From there, she became Voltaire’s housekeeper and then later much more, with the pair for a time posing as a married couple though they never actually married. They stayed together until his death in 1778, at which point the vast majority of his estate was left to her, including his heart, which, along with his brain, was removed from his body and boiled in alcohol after his death to preserve it. She kept it and past it on to her heirs. A little less than a century after his death, however, it was donated to the National Library of France. As for what happened to his brain, this isn’t clear. At first it was kept by his heirs, but ultimately it appears to have been included in an auction with some furniture. Who bought it and what they did with it has been lost to history. But, in the end, the cash strapped French government inadvertently managed to fund one of the great mathematicians and greatest philosophers of the age, the latter of which, at least, likely would have been forgotten to history if not for his vast wealth that allowed his brilliant mind free rein to write on whatever he wished without having to worry too much about money, public opinion, or the ire of the elite. Voltaire landed himself in the Bastille after French nobleman Chevalier de Rohan made fun of his pen name. Not being one to take insults lightly, and being amazingly witty, Voltaire supposedly responded to the insult in kind, getting the better of de Rohan. De Rohan was not pleased and sent a few of his servants along to beat Voltaire, which they did. Voltaire then threatened a duel with De Rohan if damages were not paid, at which point De Rohan simply got King Louis XV to have Voltaire imprisoned without trial. (Voltaire’s post-lotto wealth shielded him from such things happening again.) He may have been left in prison for the duration of his life, but he suggested that he be exiled to England, which he eventually was. @Alex: References are below the article. This explains the hit YouTube video by Epic Rap Battles of History. 10/10 post. Is it knownot if anyone ever tried to forget Voltaire’s brain? Known not know not. My autocorrect got weird there.